Jordan Davis and Tristan Martin are long-time friends and now, they make up Astro Lasso, an electronic indie-pop band from Pennsylvania. Throughout the late winter and early spring, Astro Lasso is on a 25 city tour throughout the United States of America. So far, Jordan says performing in New York City has been his favourite and Tristan is anticipating performing in Chicago and Los Angeles. While on tour, Jordan and Tristan have launched a partnership with Big Brothers Big Sisters of America, spearheading the Mentoring through Music campaign. They’re mentoring and guiding youth of all ages to encourage and celebrate self-expression through creativity and the arts. We caught up with Jordan and Tristan to learn more about the Astro Lasso story and what it’s like to be on a massive country-wide tour. Astro Lasso. Photo by: I AM Chanelle. Where did the name “Astro Lasso” come from? You are childhood friends from York, PA. How did you meet? What’s your earliest memory together? What was it like growing up in York, PA? Please paint a picture for our readers. How early in your friendship did you start making music? So much of my childhood revolved around trendy music – old and new music was always on. What were your first favourite songs or bands? Frankie Muniz is managing you, which must be pretty cool! How did you connect with Frankie? How is it working with him? He’s a great manager. When he was in Kingsfoil he was always really good at the business side of things. He actually loved it! When we started this new project it really seemed to be a perfect scenario. We are all great friends so the team and vibe has been amazing. We’re pumped. So many of our readers are creators, entrepreneurs and artists. When did you realize you wanted to create for a living? Creating can take a lot of energy and it’s often easy to lose inspiration/that creative spark. Where do you go to find motivation and refill that spark when it’s running low? Excluding music, which other ways do you express yourselves creatively? What’s the hardest part about working in the music industry? 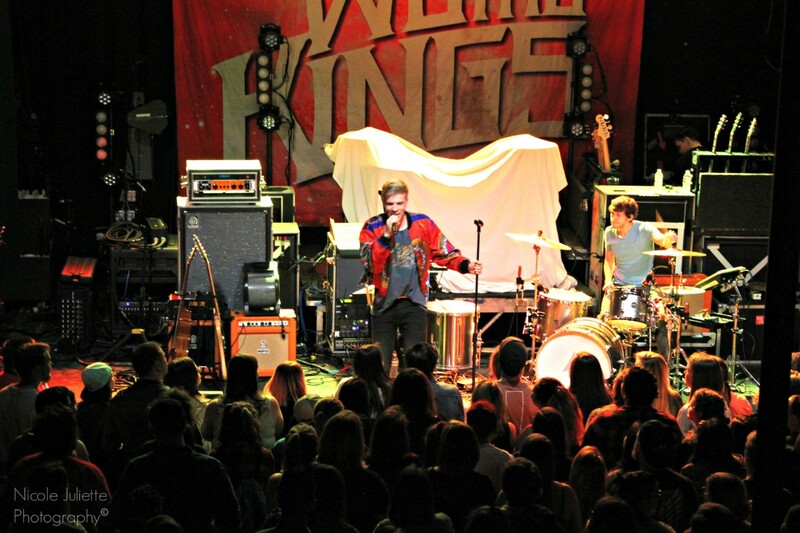 You’re currently on tour with We the Kings and have 25 shows planned. Is this the first time you’ve been on such a major road trip throughout the USA? For Astro Lasso it’s by far the biggest tour we’ve ever done. We’re so thankful and honoured. It’s actually our first tour as a band! And the first show on tour was our first show ever! It has been an amazing way to get our feet wet as a band! What has been the best part about the first part of this tour so far? Why? Getting to tour with all the awesome bands and crew from We The Kings, Cute Is What We Aim For and Plaid Brixx has been amazing. Everyone has been so welcoming to us as a new band on the scene! The fans we have been meeting on tour have been so awesome to us! We have been getting great feedback on our music. What has been the most challenging part of the tour thus far? Why? What’s being on tour like? Is there time to recharge? There’s actually not much time to recharge. You feel like you will have down time but things end up being pretty busy. Understanding that being on tour must be extremely exhausting, while also exhilarating of course, you must crave comfort food!! What’s your go to snack while on the road and why? When we are on the east coast, Sheetz is our comfort food! We try to eat healthy though, because it’s easy to get sick if you’re not taking care of yourself while on tour. Throughout the tour, you’re going to make additional stops through the Mentoring through Music program with Big Brothers Big Sisters of America. How many Big Brothers Big Sisters will you visit along the tour route? We’re so happy to be part of BBBSA, the bigs and littles that come out so far have been so nice. We’re so happy to be part the program! The amount of bigs and littles we meet varies on the tour stops, so far we have met a handful of matches and we loved playing for them, it was such an honour. I hear you’re planning on performing acoustic sets and inviting participants to your all ages shows for meet and greets. What does this opportunity mean to you? Music is one of the few things that can bring people together. So it means a lot!! What impact do you hope “Mentoring through Music” has on Big Brothers Big Sisters? We hope it can inspire kids to want to play music, like we said, it can truly bring people together. What’s next for Astro Lasso post-tour? After we finish this tour at the end the March, we are heading back into the studio to work on a second album! We want to release music as quickly as we can! For more information on the band, visit astrolasso.com and follow them on Facebook, Instagram and Twitter. Astro Lasso’s music is also on iTunes and Spotify.